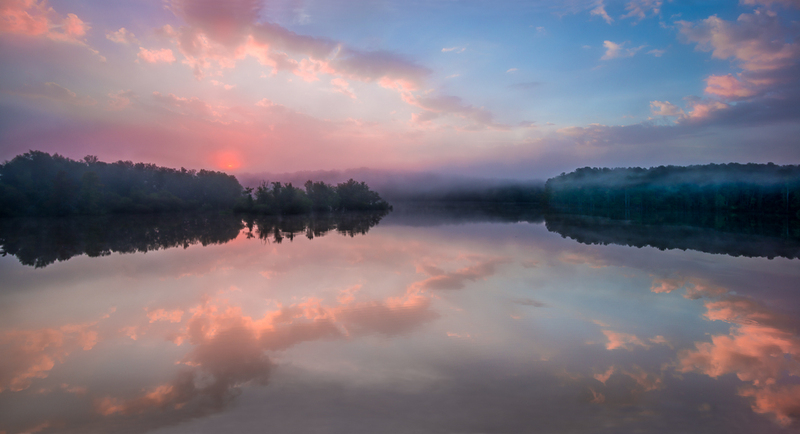 There are two favorite spots around Jordan Lake that I go to when I want to include reflections of the sky, and one of those is at a bridge which I went to the other morning when I saw a sliver of clear sky along the eastern horizon of a mostly cloudy sky. When I arrived there, the color had already begun to creep into the clouds and I photographed it as the light got increasingly better with each passing moment. I did panoramas and single images and kept at it until I thought the light had begun to peter out when I remembered the old suggestion to always look behind you, because you may find something just as wonderful. 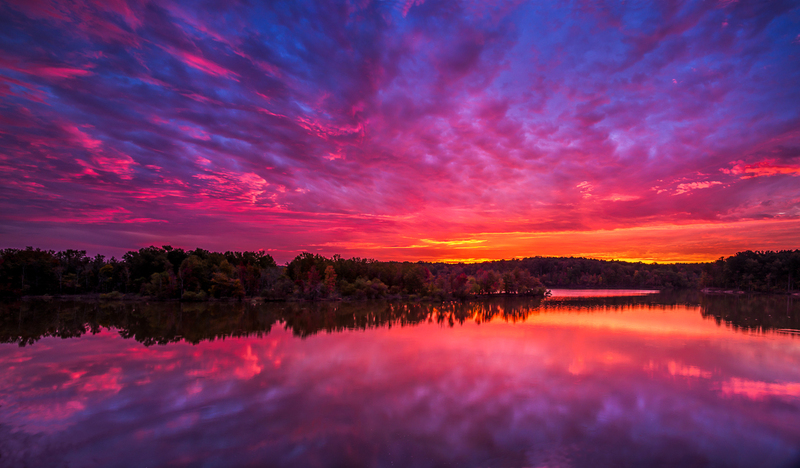 When I turned around, sure enough I found that the color in the clouds had gone clear to the western horizon! and since the light was coming from the east, the trees along the shoreline had much more definition, autumn color and texture, unlike looking east where they were mostly in silhouette. Since I was on a bridge, all I needed to do was cross the road and begin photographing the wonderful light on that side. So, it’s crystal clear to heed the advice of those who came before us. After all, they have gone through this before. 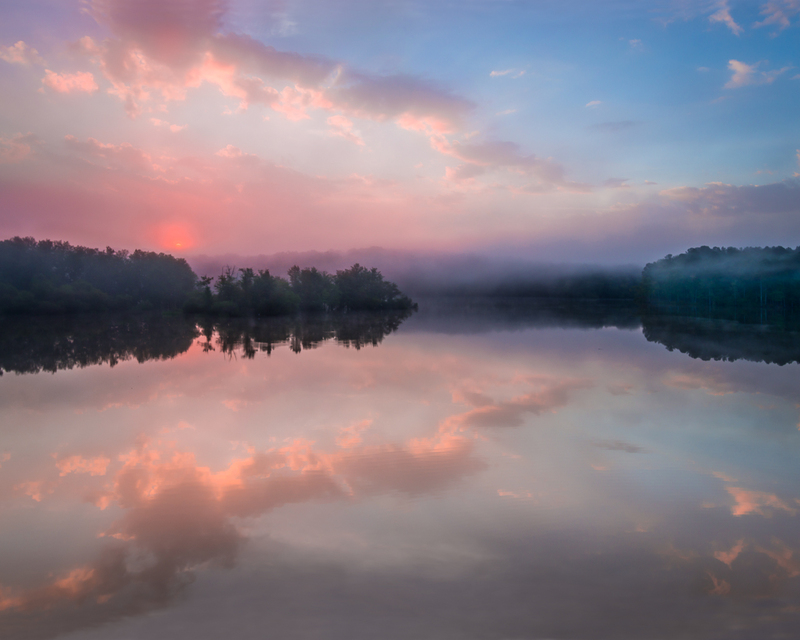 As is usually the case, if I get up early enough, I look out the window into the dark to see if there are any clouds that may be the basis for a good sunrise, and if there are, I head out to Jordan Lake. The other morning held some promise, so I ventured out to try to take a shot of the lake I had waited years for. The water level was finally high enough after all the recent rain, and that’s what was needed for a spot that had a solitary line of trees emerging from the high water. Normally, the ground beneath the trees is visible and appears normal, but without it, the scene took on an otherworldly look. 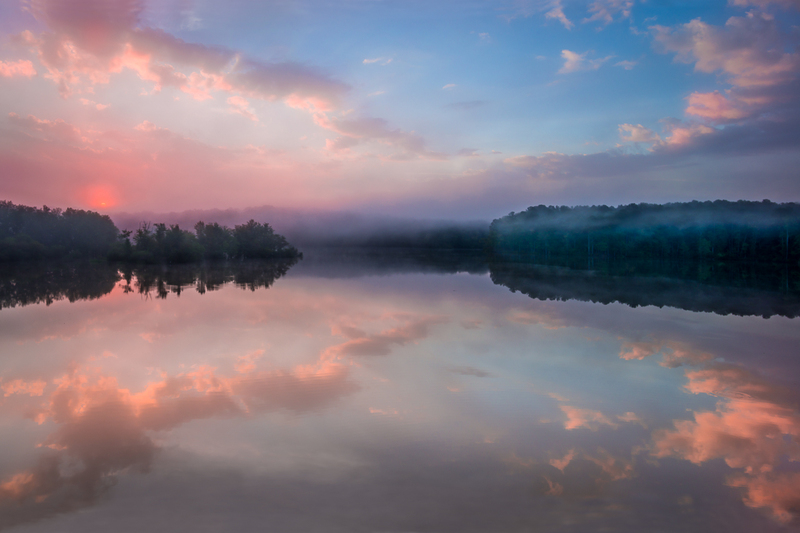 Although the angle looking toward the trees did not face directly east into the sunrise, I had hoped that some clouds might light up in the northeast as well to provide the interesting backdrop and reflections necessary, and I would finally get the shot I’ve been after for quite some time. But as I drove nearer to the lake, fog began to appear and was particularly thick at my intended location. It was unfortunate since the winds were calm and the reflections were perfect, but there would not be anything lighting up with the sunrise here. It was disheartening, but I’ve become accustomed to these disappointments since I understand there are so many variables that all need to come together to produce the conditions for a great sunrise or sunset. So it was with a bit of tempered despair that I headed back home. On the way, I happened to drive by an area of the lake that I’ve used many times before and found to my surprise that the fog there had cleared enough to reveal some clouds above that reflected in the still waters!! I jumped out of the car and threw my camera onto the tripod, figuring I only had minutes before the clouds would lose the glow from the rising sun, and managed several shots with a 2-stop split neutral density filter to even out the light values of the sky and reflections, even having time to do a four image panorama with the camera vertical for stitching together later. I probably could have saved the effort since there was still enough fog lingering among the trees to render them soft instead of being really sharp, so the additional information afforded by the panorama was probably not necessary. A minute or two later, there was the added bonus of the sun peeking through the fog as it rose above the treetops giving off a beautiful pink/orange glow through the fog, creating the focal point the scene lacked beforehand. It was just icing on the cake making the morning all the more satisfying after the earlier disappointment. Back at home, after processing the images from the morning into the panorama at the top, I tried cropping it down into my normal 4:5 ratio and found that there was not really any satisfactory crop; there was always something that broke down the balance or there was a distracting element within the frame as there is here on the right. This was the best crop from several attempts at the 4:5 ratio, but the small clouds on the right seem too distracting for my taste. When shifted to eliminate the distractions, the two lines of clouds form a perfect arrow leading the eye right out of the frame. However, if I crop to the normally wider 4:6 ratio, the cloud and its reflection do not seem as distracting. The downside to this crop (on the left) is that the rising sun is then squeezed a bit toward the left side, leaving the balance off a bit. Slide it over a slightly to the left to give the sun more space on the left side, then the clouds on the right are cut through the middle. In addition, there isn’t that much difference from the complete panorama which eliminates the crowding of the sun on the left. As it turns out, I was fortunate that I did another panorama after the sun appeared, simply for the balance of the final image. So each time we venture out to make an attempt at recording the events of the day, you just never know how things will ultimately turn out. But I do know that had I stayed home, I never would have been there to witness such a beautiful sunrise. And if I hadn’t taken the second panorama, the fortune I had to come across this scene in the first place, would have been lost because of the subsequent problems with composition and cropping. Maybe next time the clouds will cooperate and be in the proper position! !